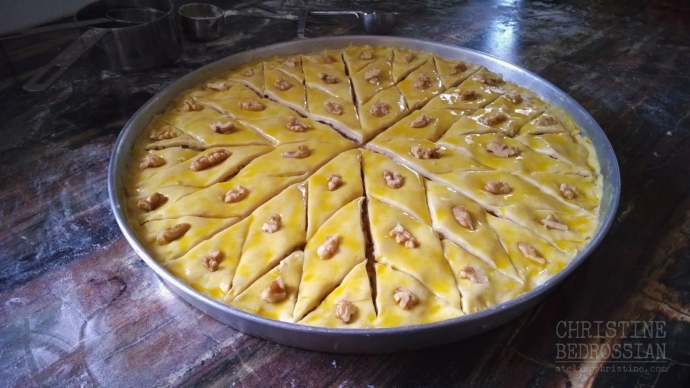 Traditional Armenian pakhlava is quite different from the multi-layered phyllo (filo) dough baklava made throughout the Middle East, the Balkans and surrounding regions. 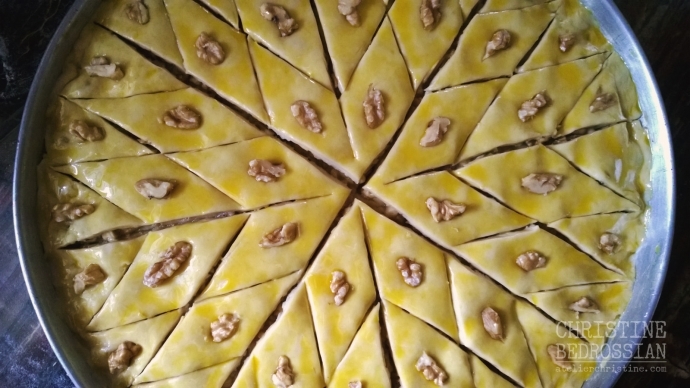 It has a bit of sugar but is not overwhelmingly sweet, is made with thicker sheets of homemade pastry dough and has more chunky walnut pieces layered in between; or as I say it, pastry dough sandwiched between oodles of walnut. Since this baklava is not drenched in honey or simple sugar syrup it keeps well and stays crunchy. 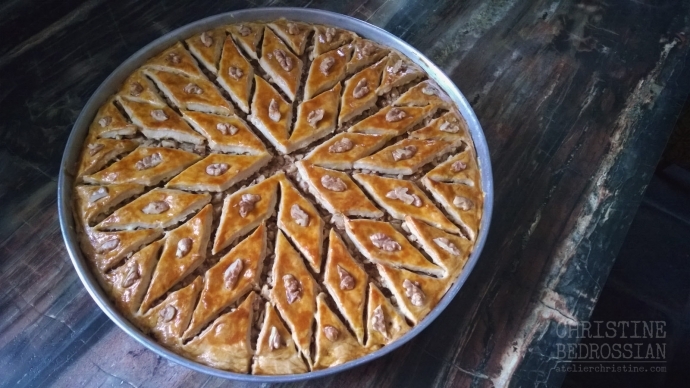 Homestyle Armenian walnut baklava should be scored into diamonds before baking and re-cut once again after baking. Use a very sharp small paring knife lightly dipped in flour and create two lines down the center of the pan, one vertically and another horizontally, dividing the circle into quarters and creating four wedges. 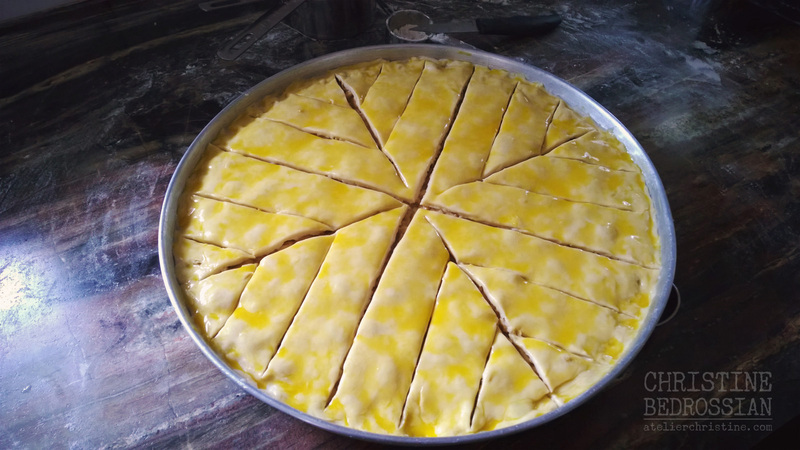 Divide each quarter into two to create eight equally sized wedges. 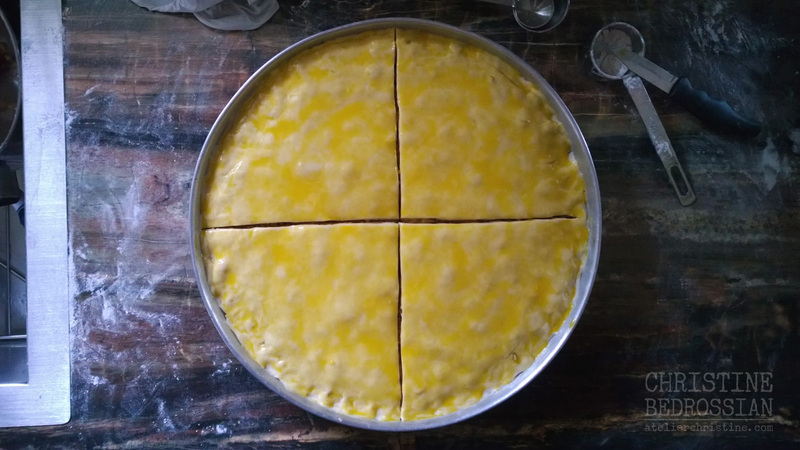 Continue cutting dough as indicated in the photographs to complete the pattern. To add a decorative touch, gently press a halved walnut into the center of each piece. Use this pattern scoring technique to cut and decorate dough-based pakhlava, phyllo sheet baklava, your favorite layered dessert, pan-pressed baked kibbeh (kibbeh bil-sanieh, apseyov keufte) or for any cookie, dessert, pie and pastry that you want to cut into a lozenge (diamond) shaped pieces.